“And I looked for one that would grieve with me, but there was none: and for one that would console me, and I found none”. In the present time of the Church’s Passion, Our Lord renews this complaint from Psalm 68 (verse 21). However, how can Our Lord, Who is gloriously reigning in Heaven, be sad and ask for consolers? Accordingly, we can say that Our Lord Jesus Christ is saddened insofar as the members of His Mystical Body are afflicted, as is presently the case of so many Catholics being persecuted under Islamic, Communist, and Hindu regimes. Secondly, Our Divine Lord is saddened in the sense that the sins of men cause Him to turn away. In the prayer of the Act of Contrition, do we not say that sin offends God, or displeases Him? It is a way of saying that God acts toward the sinner in the same manner as someone who, upon receiving an offense, suffers grief and separates from the person who has given the offense. Thus, because Our Lord Jesus Christ is “the Word made flesh” (something which cannot be said of the Father or the Holy Ghost), there is a third reason for His sadness: while He was on earth, particularly during His agony in the Garden of Olives, Our Lord experienced a veritable sorrow: “My soul is sorrowful even unto death (Mt 26:38)”. Now, Our Lord was grieved by the sins of all men, including those being committed today. Our Lord had a perfect knowledge of all these sins thanks to the “beatific vision” which He possessed from the moment of His conception. 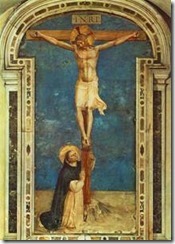 When Our Lord asks us to console Him, He is asking us to comfort Him with respect to this triple sadness: that of His Mystical Body, by consoling persecuted Christians; the metaphorical sorrow of His Divinity offended by our sins, by doing penance; and that of His Sacred Humanity, by sharing in the pains of His agony, especially through the practice of Holy Hours, but also through the meditation of the Rosary, attending Mass, and receiving Holy Communion in reparation: “Take and drink the Body and Blood of Jesus Christ, horribly outraged by ungrateful men. Make reparation for their crimes, and console your God” (the angel to the three children of Fatima in 1916). “One day, I asked him, ‘Francisco, what would you rather do: console Our Lord, or convert sinners so that there will be no more souls going to hell?’ He answered, ‘I prefer to console Our Lord. Didn’t you see how Our Lady looked so sad last month when she told us that no one should offend Our Lord anymore, because He has already been offended too much? I would like to console Our Lord and then afterwards convert sinners so that they will no longer offend Him’” (see the Sel de la Terre, #53, pp.232-233). Today, more than ever, Our Lord is saddened: by the persecution of Catholics everywhere in the world ─ including the more hidden, subtle persecution taking place in our formerly Christian nations, carried out by secularist propaganda, whose program is to instill atheism in the souls of men; and by the worldwide revolt “against God and against His Anointed One” (Psalm 2:2) ─ including in His Church, where the modernists “prefer the fables of men” (2 Tim. 4:4) rather than Tradition. Let us console Our Lord by our efforts to live a truly Catholic life, for example, by not wasting our time with audio-visual entertainments, or with other useless amusements, by fleeing excessive modern-day comforts that only make us soft and lazy, by reading a good catechism or other edifying books, etc. 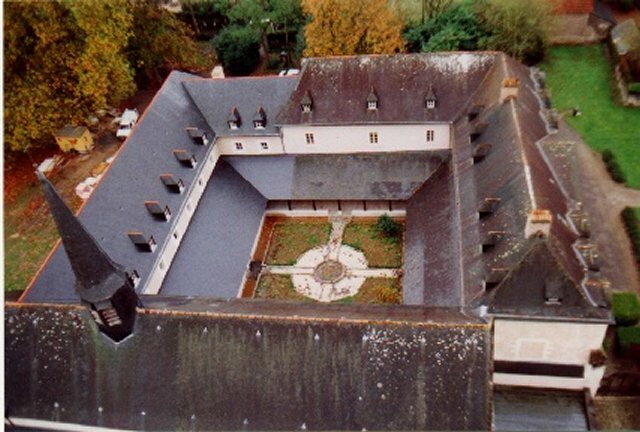 December 31st: The community goes on pilgrimage to one of Anjou’s most hallowed sanctuaries: “Our Lady of Béhuard” situated on an island in the middle of the Loire River. After Compline, a (growing) number of faithful join us in singing a Te Deum of thanksgiving (with a plenary indulgence). January 16th: Mr. François-Xavier Peron gives a conference for the faithful on Pope Francis’ revolutionary “Synod on the Family”. February 3rd – 4th: Father Prior and Father Marie-Dominique preach the preparatory retreat to the seminarians of Saint Louis-Marie Grignion de Montfort Seminary before their cassock-taking. February 5th: Pontifical High Mass and imposition of the cassock by H.E Bishop Faure for six seminarians. February 21st: Fathers Marie-Dominique and Reginald lead the boys of the Marian Congregation of our school on a pilgrimage to Pontchâteau, in Brittany, to pray at the famous Calvary of St. Louis-Marie Grignon de Montfort. February 27th: Fathers Angelico and Hyacinth-Marie are with the “Our Lady of Fatima Youth Club” for one of the regular outings in the countryside of Anjou. 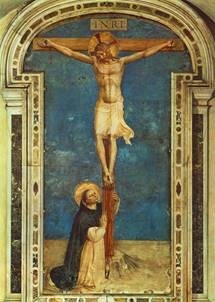 March 7th: Feast of St. Thomas Aquinas, light of the Church and glory of the Dominican Order! The festivities include a Solemn High Mass and a conference on the method of St. Thomas. We also have the joy of receiving the visits of Fr. McDonald, Fr. Bruno (U.S.M.L. ), and Sr. Marie-Liesse (former SSSPX). March 24th: Holy Thursday. For the first time at the Friary, we are graced with a Chrismal Mass, officiated by H.E. Bishop Faure. At this Mass, the Bishop consecrates the Holy Oils necessary for the sacraments of Confirmation, Extreme Unction and Holy Orders (and solemn Baptisms) during the coming year. What an eloquent demonstration of the importance and necessity of the recent episcopal consecrations! Without Bishops, it is impossible for priests to continue their apostolate, and have their candidates ordained to the priesthood. March 26th – 27th: Easter Vigil. The wind and rain seem to be stirred up by the devil (no doubt angered by the two adults to be purified in the waters of Baptism that night) in order to prevent the blessing of the new fire and the procession with the Easter candle. Their efforts are to no avail, and the Vigil Mass is celebrated in presence of an unusually large and fervent crowd of faithful. April 12th: Classes start back up for the schools, the clerical brothers and the seminarians. April 17th: Fr. Marie-Laurent, accompanied by two seminarians, mans a booth at the annual assembly of the “French Renewal” patriotic movement, in Paris. More and more people are worried about the world political situation; our presence at such gatherings allows us to help souls analyze current events under the light of the Faith. May 5th: Feast of the Ascension and annual gathering of the alumni of St. Thomas Aquinas Boys’ school. What a consolation to witness the perseverance of former students, and hear them say “thank you” for the doctrine and apologetics courses they received! May 13th-15th: Fr. Angelico and Br. Louis-Bertrand are at Le Puy-en-Velay (France’s oldest Marian Shrine) for the Pentecost pilgrimage of the Combat for the Faith. In his sermon during the Pontifical High Mass on Sunday, His Excellency Ferreira da Costa (Dom Thomas of Aquinas O.S.B. 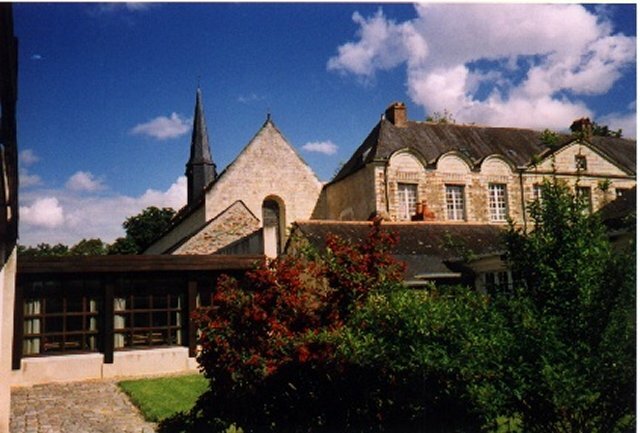 ), recounted how the official recognition of the conciliar church led inevitably to the abandonment of the combat for the Faith in the Barroux monastery (France) and Campos (Brazil). His conclusion: it is now up to us to continue the fight! The installation of the new library is progressing. One by one, the donated movable bookshelves are being adapted by a local ironsmith to fit the rails on the floor. 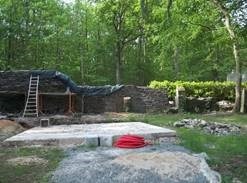 A large part of the stone wall protecting the property having collapsed, “Eddy”, our maintenance man (a professionally trained mason), is doing a beautiful job in restoring it with the help of a few of the high school boys, happy to learn the trade. 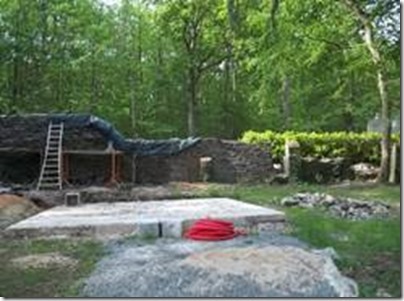 Stone wall under repair. In the foreground we see the beginning of the foundations of a future wood shop for the boys’ school. -The paving of the parking lot and two entrance roads, which have been seriously deteriorated over the years by the steady increase of traffic (daily drop-offs and pick-ups for the school children, three Sunday Masses, as well as other various parish activities). - New buildings for the Friary workshop. For the moment, the lay brothers work in temporary barracks built by the US army in 1945, and we’re not sure how long they will remain standing. (A wood shop for the boys’ school is also planned). -The refurbishing of the Chapter room; in particular, the installation of a worthy altar for the daily Masses which are celebrated there. On July 1, 2015, on the Porte Latine, website of the Society in France, Fr Bouchacourt, Superior of the District, published a communiqué warning against the Dominican community of Avrillé. The same communiqué was also published in Fideliter 227, September/October 2015, magazine of the Society in France. The Dominicans answered respectfully on their Website. As the Society is now spreading the English translation of the communiqué of Fr Bouchacourt, the Dominicans publish here their answer in English. 1. For more than a year the Dominican Fathers of the friary in Avrillé have been spreading and supporting defiance against the authorities of the Society of St. Pius X, especially with regard to Bishop Fellay and the General House. During conferences, in publications and on their website, they have accused the superiors of the Society of St. Pius X of giving up the good fight for the Faith in order to drag the Society at all costs into an agreement with the Roman authorities. We have tried, in vain, during various meetings, to prove to them the contrary and to show them that their attitude was imperiling the unity of Tradition by sowing doubt and division. This communique intends to re-establish the truth so as to defend the honor of our superiors and that of our priestly family. The Dominican Fathers take a position in favor of the episcopal consecration of Bishop Faure on March 19, 2015, and publish a long dossier justifying this act in Le Sel de la terre, no. 92 (Spring 2015), pp. 139-169. But in this they are laboring entirely under a delusion and are drawing into it all who follow them. For Archbishop Lefebvre always conducted this fight for the Faith not only in doctrinal fidelity to Tradition, but also in order, in unity and in peace, in the spirit of obedience. The Fathers of Avrillé are not faithful to these principles, for they denigrate the authority of Archbishop Lefebvre’s successor and cast suspicion on the acts of his government so as to create a dialectic between the members of the Society and their superiors, setting even the priests one against another. In order to detach oneself [lawfully] from an authority, it is necessary for the latter actually to urge the subjects to sin against faith or morals. Now the Dominicans of Avrillé cannot show which acts performed by the Superior General demonstrate that “Menzingen is betraying the fight for the Faith.” Therefore the General House is not the one that is currently betraying this fight for the Faith; rather, those who label themselves the “Resistance” are the ones who are weakening it by their subversive manoeuvers. In supporting the episcopal consecration of Bishop Faure, the Dominican Fathers of Avrillé make themselves accomplices in a harmful act and do serious damage to the common good of Tradition, inasmuch as the only reason mentioned to justify this act is based on the unproven accusation that the Society of St. Pius X had abandoned the fight for the Faith. 5. It is obvious that no superior who is responsible in God’s sight for the good of his district can fail to react to these repeated provocations [prises de position]. We cannot allow distrust, division, or a partisan, disparaging spirit to become established within our ranks. This is a matter of the common good of the flock, and the first duty of a pastor is to preserve its unity and cohesion by putting it out of the reach of these troublemakers. 6. Consequently, given so many dishonest accusations, the District of France can no longer support the Dominican community in Avrillé which, by its subversive schemes, is sowing doubt and division in the ranks of Tradition and weakening its forces. This situation is very regrettable. May the Holy Ghost enlighten the superior of the Dominican community in Avrillé, and may Our Lord and Our Lady keep us in the unity of truth and charity, faithful to the good fight for the Faith conducted by Archbishop Lefebvre, for the honor of Christ the King, that of Holy Church and the good of our souls. Our disagreement with the Superior General of the SSPX arises from the fact that the superior is prepared to make a practical agreement with authorities who still profess the conciliar errors. “The contacts that the Society has from time to time with the Roman authorities has as its only goal to help them once again to take ownership of Tradition, which the Church cannot deny without losing its identity, and not the search for an advantage for itself, or to reach an impossible purely practical agreement”. * In March 2012 Mgr. Fellay announced that he was abandoning this principle ( by affirming: “ it is not a question of a principle but of a line of conduct”). This abandonment was supported by the Chapter of 2012. Since then, despite numerous entreaties, Mgr. Fellay has refused to return to the former principle. * On the 31st of May 2012, we wrote to Father Bouchacourt: “It is because we wish to keep this principle – which is the legacy of Mgr. Lefebvre – that you are preparing to condemn us. Or rather that Mgr. Fellay is preparing to condemn us by your mouth”. The words in inverted double commas are wrongly attributed to us: we are not the authors ( see Le Sel de la terre 92, p.141). What we do say (and it is obvious from point 1), is that Menzingen has changed its line of conduct in its relationship with Rome, engendering a loss of confidence amongst a great number of traditionalists. Point # 3. The communiqué reproaches us for having published “ a confidential correspondence exchanged with Mgr. Fellay” in Le Sel de la terre 89, p.215-22. It is sufficient to refer to the published text to see that there is nothing confidential in these letters. Mgr. 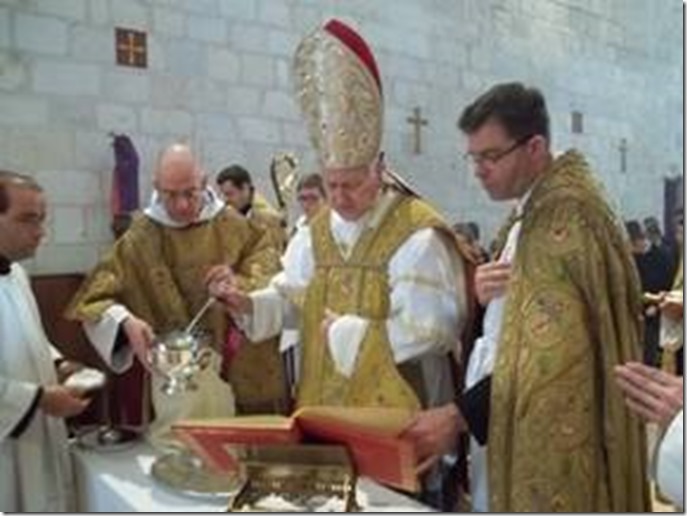 Fellay forbade us all collaboration with the Society, deprived us of ordinations and of the holy oils. It was normal that we should make known the reasons on which he purported to lean, and also that the rupture came from his side and not ours. We have expounded several grave objective reasons which justify the episcopal consecration of Mgr. Faure ( see Le Sel de la terre no. 92, p.139-170, and no. 93, p.200-208) and notably the fact that Mgr. Fellay refuses ordinations and even the holy oils (necessary for several sacraments, in particular extreme unction) to our community and to several others who do not share the new policy established in 2012. As Mgr. Lefebvre said, it was a matter of fact (de facto) and not of right. This fact could have endured for a long time, if Mgr. Fellay had not taken the decision to break the unity of Tradition by changing the line of conduct with regards to Rome, and by excluding Mgr. Williamson from the Chapter of 2012, then by expelling him from the Society because he did not approve this change in the line of conduct. Is that all ? …. The truth is something which accords with reality. Also before “so many false accusations” we are happy to say to the readers of the communiqué: “Come and see”, read our publications (Le Sel de la terre, our Letter to friends and benefactors, our English website), and see if what can be found there is compatible with the melodramatic description of the communiqué. The reality is that despite the differences with the Superior General about his new policy towards Rome, on our part we remain friends of the Society, and we wish it to overcome the crisis which it has been undergoing since 2012. This letter is to notify you of my decision to leave the Society of St. Pius X. In spite of my sermon on April 17th last, many of you will be surprised to learn of my departure. I hope then that these lines will show more clearly the reasons why I am leaving. I would like to say first that I did not wish that my sermon of April 17th be published urbi et orbi and that I myself did all I could to prevent its diffusion. I was preaching merely for the chapel of Montreal, that portion of the Lord’s flock entrusted to me by my superior. With that said, the Lord has willed that it be otherwise. Blessed be his Holy Name! I was born and raised in the arms of the Society. I owe everything to the work of Archbishop Lefebvre. This is why I am well aware of the gravity of the action I take before God and before yourselves, and aware also of the duty one day to account for myself before the Tribunal of the Just Judge. You also know, dearest faithful, that the Society has always called it illegitimate to align oneself with those who have removed themselves from Tradition and no longer profess the Faith in its integrity. Why, after all, have we permitted ourselves these last 30 years to criticize the Fraternity of Saint Peter? Why have we more recently criticized Campos? Why did we repudiate the agreement reached in 2006 by the Institute of the Good Shepherd? Having recently asserted to a superior that it will be necessary for us to cease criticizing these communities, I received the following response: “Ah, but we will continue to criticize them!” I then asked why, by what principle. I received no further reply. No, either we have been wrong since 1988 and even since 1975, or we have been wrong since 2012. Unless we too adopt a subjective conception of the truth, and what was true in 1988 is no longer. A last solution – by means of which seemingly anything can be justified : the situation has changed. We are witness, says our superior general, to a turning point in the history of the Church : they no longer want to impose the Council upon us; Pope Francis “appears to be someone who would like to see the whole world saved, that everyone have access to God,”2 he continues. Did Jesus not say, “If you love me, keep my commandments”? (John 14:15) One may seriously ask himself if Pope Francis, who practically denies the commandments before the whole world, truly seeks to save souls. On the other hand, did Archbishop Lefebvre not write in his Spiritual Journey, his testament to his priests, “It is the strict duty of every priest and layman wishing to remain Catholic to separate himself clearly from the Conciliar Church, for so long as she does not profess the tradition of the Church’s Magisterium and of the Catholic Faith,”3 as we were reminded by Bishop Tissier de Mallerais not so long ago? Some will say, “It is not yet done. Wait until it is done!” This is what I myself said to many among you, my dear faithful, for some years, hoping and believing sincerely that the authorities of our Society would turn back. But I must face the evidence that they have not. Day after day, declaration after declaration, they continue to inoculate into the souls of faithful and priest alike a pernicious error, which holds it legitimate to seek from the Conciliar authority a recognition and jurisdiction that is made exceedingly dubious by this authority’s daily betrayal of the Faith. This error, which insinuates itself in the spirits of each, causes even priests known for their doctrinal intransigence (this being a virtue) to become less and less combative to the point where they will soon be ready to betray everything. Not putting in practice the advice of St. John nor that of Our Lord Jesus Christ (“Beware of false prophets,” Matthew 7:15), in discussion after discussion, and meeting after meeting, we eventually silence our suspicions, which are more than legitimate and healthy in the face of persons who deny the Kingship of Our Lord Jesus Christ. This is how our superior has become, according to Pope Francis, a man “with whom one can dialogue,” with whom he who currently directs the subversion and the destruction of the Church of Our Lord Jesus Christ believes he can do “good work.4” Is there any wonder then that they happily grant us jurisdiction for confessions (which was never lacking)? How can we claim that we are asking for nothing, but that Rome gives everything? Have we not just recently asked for the doubtful jurisdiction of conciliar Rome with respect to the other sacraments? No, truly, we ask for nothing! Rome, who scourges Our Lord Jesus Christ, wishes us well! This is rather worrying: which side are we on? The new direction of our Society is imposed on priests, on many priests who have never desired it. Enforced silences, transfers, promotions, trials, threats, promises, exclusions, all become justifiable when they work do defend the “position of the Society,” which is in fact – as always in a revolution – the position of a minority which has taken power and which deftly manipulates the passive majority. Following my sermon of April 17th, besides the desperate reactions of certain colleagues, they ordered me to be silent. They wished me to swear on my priesthood (!) to speak no more from the pulpit on the question of an accord with apostate Rome. “You have many other subjects on which you can speak,” they told me. Naturally I am conscious that the principal subject of preaching is not the joining of our Society to Rome, but the Gospel of Our Lord Jesus Christ. But I would note – you are my witnesses, dear brothers – that that was the first time in five years of ministry that I had spoken on this question from the pulpit. I refused to be silenced. However, I promised to warn my superiors before treating the subject from the pulpit again. “If you intend to speak of it again,” they told me, ‘You will have the right to confess and to say mass, but you cannot preach. Otherwise, leave the Society and say what you wish.” That is what I am doing, brethren, because a priest must preach and alert his flock to the wolves who threaten to devour them. I have no absolute certainty that the Society will join itself to Rome. Nevertheless I have moral certainty that they will do so, given the clear, express, and reiterated will of both Rome and the Society to arrive at an arrangement, and given also the absorption these last months of the last episcopal voices which firmly opposed it. That God preserve us from this tragedy – this will, in spite of my departure, continue to be my fervent prayer! In the meanwhile, having on the day of my baptism renounced not only Satan and his works, but also his seductions, I cannot accept that my immortal soul be sold to the conciliar sect, nor accept even that it be put up for sale. Consequently, the fact that the superiors of the Society have shown on numerous occasions their amenability to a practical accord (in the absence of Rome’s conversion) suffices for me to take this step, prudently, not before having prayed at length and taken counsel with wise priests. There is no question for me whatsoever of remaining silent about what is being done. I have kept silence too long, hoping and assuring you, brethren, that the Society superiors would eventually open their eyes. But the more time passed, the more was I forced to accept the evidence that those who lead us do not intend to turn back. I must confess that to speak openly of the treachery we are living through is a very delicate business if one remains within the Society. Which is why I am leaving: for the ability to preach the truth in its integrity, since I must someday answer for each of the souls entrusted to me. To keep silent was no longer possible without making myself guilty before God. In the past I have severely criticized those we call the “Resistance,” but whom others call the “Subversion,” and still others, “Fidelity.” I must say that besides the fact that I did not at that time see things as clearly as (by the grace of God) I now do, I was reacting mainly to the misbehavior of certain colleagues who visited our province and who, though clear-sighted, were rather cavalier, much to the discredit of the courageous stance taken by those who refused the betrayal imposed on us. I will try with God’s grace to avoid the attitudes I have denounced and to devote my energy to rebuilding rather than to badgering those who wish to place us in Rome’s hands. With that said, to denounce errors and deceptions remains a necessary duty which with God’s aid I will fulfill. Many clear-sighted priests do not dare for now to act against the imposition. I believe the principal reason restraining them is the fear of breaking the unity of the institutions that have with such difficulty been built up. How accept that in dividing the faithful, we risk contributing to the closure of a chapel? The reply is that faithful priests are not the origin of the division brewing in our ranks, but the very authorities of the Society, who would have us believe that we are participating in a turning point in the situation of the Church, when in fact it is not the situation that has changed, but only their minds. Dear brothers, if the directors of the Society continue to sow distrust and confusion by their mistaken ideas, the division will swell, and it may become necessary to burst it open in our region for the common good. However, it remains clear that the more the situation deteriorates, the more it will become necessary to tend to souls in Quebec who feel betrayed and deceived. My hope is that more priests arise and come carrying the truth to those who desire it for themselves and their children. Because while it is obvious that the Society continues to disburse the help of the sacraments – of which it would be illegitimate to deprive oneself without very grave reason – it is no small thing in this crisis of the Church to have access to sound preaching and to continue to see clearly through the painful events we are experiencing. Begging you pray for me, I also assure you, dear brethren, of my prayers at the altar and of my blessing.